What Makes The Navajo National Monument A Unique Place To See? The Navajo National Monument sits on the Navajo Reservation in northeast Arizona. It is a tourist destination likely unknown by those living outside of Arizona. Northern Arizona tourists usually visit the Grand Canyon, Painted Desert and Petrified Forests. Residents know better. Arizona destinations that don’t appear on the travel radar of most tourists abound. The Navajo National Monument is Arizona’s largest prehistoric cliff dwelling. It holds a massive formation of Anasazi ruins. The Anasazi tribes were the forefathers of the Pueblo and Navajo tribes. The Anasazi tribe left behind the community they lived in. The Anasazi’s lived there for only about 50 years. But the artifacts they left behind provide a unique look into their lives and culture. The location was well thought out. Curved sandstone walls created support their dwellings build of masonry walls and roof beams. Two distinct cliff dwellings areas sit under the overhanging cliffs beneath the Tgesi Canyon. Betatakin, means “ledge house” in Navajo. 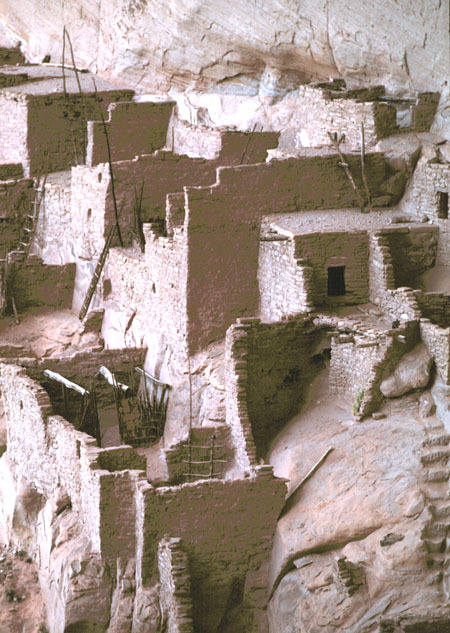 It features a cluster of 135 cliff dwellings. These “rooms” sit on the edge of a sheer sandstone wall. Betatakin is a amazing look at the skill of ancient workers who forged their homes from bare stone. The Betatakin site was discovered in 1907. Dwellings contained a vast array of basketry, pottery preserved corn ears and grains. Hiking tours to the site is strenuous. It is about five miles and includes a 700 foot decent down the canyon. The hike to the Betatakin site and back is a four hour round-trip. For those wanting a less difficult hike, take the trip from the visitor center to the canyon rim. This is about a ½ mile walk. The view of the Betatakin cliff dwellings is amazing. Keet Seel, means “broken house” in Navajo. The site was first occupied around 1250. Much of the construction took place between 1272 and 1275. Up to 150 people occupied the site during its peak. The Keet Seel site has been well preserved. The dry climate and overhanging cliffs formations protected the site from the elements. It is one of the best preserved larger ruins in the Southwest United States. You just don’t “pass by” the Navajo National Monument. You have to want to see it. Being “out of the way” means visitors usually stop in Flagstaff or the south rim of the Grand Canyon. So, the first reason “why” it’s worth the trip are the bragging rights! Second, the photo opportunities are just out of this world. The sandstone walls change color throughout the day. The colidascope of color and views are mesmerizing. Third, you don’t have to be an explorer to find them. You can drive. Right here in Northeastern Arizona. If you are in Tucson AZ, a trip to the Navajo National Monument is a great over-night or weekend excursion. The tour to Betatakin site gives you a close-up look at an ancient marvel of engineering. Take note, the tours last three to five hours and are strenuous. Summer hours: The summer season starts May 29, 2016 and ends September 10, 2016. The visitor center is open 8 A.M. to 5:30 P.M. everyday. Both Sunset View and Canyon View campgrounds are open. The Sunset View Campground has water and restrooms available. But does not have dump station and hook ups. The Canyon View Campground is primitive. You have to bring your own water. But, composting toilets are available. The three short rim trails are open Sandal Trail, Aspen Trail and Canyon View Trail. Longer hikes to Betatakin and Keet Seel are available daily. Daylight Savings Time is in effect during the summer season. That means it is one hour ahead of Mountain Standard Time (MST). Winter hours: The winter season starts October, 2016 and ends May 2017 Memorial Day week. The visitor center is open 9 A.M. to 5 P.M. every day. Sunset View campground is open. But, only the three self-guided rim trails will be. Sandal Trail, Aspen Trail and Canyon View Trail are open, but watch for ice and slippery spots. Oh, one more thing. If you are there in the winter months, dress warm. It is chilly at these elevations. Places to stay are scarce. The Anasazi Inn of Tsegi Canyon and the Navajo National Monument Campground. The inn is located nine miles west of Kayenta on US 160. It offers spectacular views of the canyon and has a restaurant. For the more cost conscious or adventurous, the campground is free. The campgrounds are well maintained. If you want to cook your own meals, bring a camp stove. Open fires are not permitted. There are lots of great day trips from the greater Tucson, AZ area. However, if you want to see a place that is just flat out incredible, take some time to visit the Navajo National Monument. You won’t regret it! And if you are thinking of Tucson Arizona for a winter retreat, new job or future place to retire, we can help.